One of the most persistent themes in geoscience is scale. Some properties of the earth are scale independent, or fractal; the shapes of rivers and coastlines, sediment grain shapes, and fracture size distributions might fall into this category. Other properties are scale dependent, such as statistical variance, seismic velocities (which are wavelength dependent), or stratigraphic stacking patterns. Scale independent phenomena are common in nature, and in some human inventions. For example, Randall Munroe's brilliant comic today illustrating the solutions to tic-tac-toe (or noughts-and-crosses, as I'd call it). It's the optimal subset of the complete solution space, which shows its fractal nature completely. 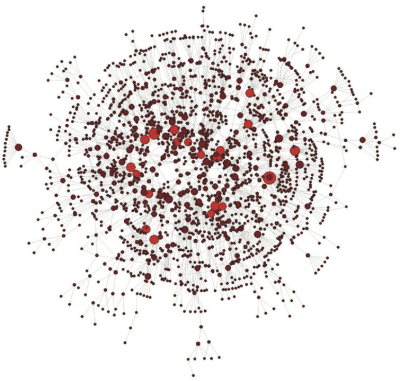 The network of co-authorship relationships in SEG's journal Geophysics is also scale-free (most connected authors shown in red). From my 2010 paper in The Leading Edge.